It would be nice to pretend that on July 3, 1996, CBC.ca suddenly came online in some sort of electronic big bang (or, if you prefer, an act of electronic creation). Of course, it didn't happen that way, not by a long shot. True, it was 10 years ago that the corporation launched Newsworld Online, its first serious foray into online news and information. But that website (and those that have followed) was merely a significant evolutionary step. Before CBC.ca, before Newsworld Online, there was a long prehistoric period. It was an era of networked televisions, Gopher and FTP archives, and primitive websites. These too deserve celebration, even though their own 10th anniversary dates have come and gone. If CBC.ca has a Paleolithic predecessor, when crude networking tools first became available, it's a 1980s networking experiment called Project IRIS: "Information Relayed Instantly from the Source." A joint project of the CBC and the federal Department of Communications, IRIS sent data to Canadian homes through their television sets using a teletext technology called Telidon. CBC Archives video: "Telidon: Knowledge at your fingertips!" It took advantage of an unused part of the television signal called the vertical blanking interval (VBI) – the black bar sometimes seen at the bottom of a malfunctioning TV set. A small portion of this interval is used to carry closed captioning text. Telidon used it to send news, information, sports and weather data to test homes in Toronto, Montreal and Calgary. Robin Rowland, now a web producer and photo editor for CBC News Online, was one of IRIS' first journalists. A former CBC Radio producer, Rowland was working in England using a similar technology called Prestel, first for a travel agency and later for a press release agency called Universal News Services. When the Canadian government needed experienced people to run Telidon, it came knocking on his door. "They were supposed to recruit Brits to come to Canada to work on Telidon," Rowland recalls. "When they found out there was a Canadian working here using Prestel, the High Commission called and took me out to lunch." Rowland was convinced to return to Canada to work at a Southam Telidon project called Infomart, then moved to CBC's Project IRIS. He joined a small newsroom that generated stories exclusively for the 200 Telidon decoders placed in test homes in Toronto and Calgary. Using a handheld keypad, IRIS users could scroll through pages of news, and there were plans to add program transcripts, weather updates and even video games. But it never got that far. Mulroney-era CBC cutbacks led to the cancellation of the project in November 1984. And Rowland points to a more significant change that happened at the same time: the explosion of home computer sales. "The experts were predicting it would take 20 years to develop a home computer," Rowland says. Telidon was supposed to fill that gap, connecting home televisions to distant mainframe computers. "They didn't predict guys like Steve Jobs would be building computers in their garages," Rowland says. "By 1984 the rationale [for IRIS] wasn't there any more." Telidon faded away, becoming a little-used early PC graphics standard, and then died. Though there would be other attempts to make televisions interactive using different technologies, the Telidon experiment was a commercial failure. Rowland spent the next decade working as an author and freelance writer, rejoining CBC as a lineup editor for Newsworld in 1994. Two years later, when CBC was once again ready to send text news into Canadian homes electronically (this time as Newsworld Online), he parlayed his IRIS experience into one of the corporation's first jobs writing for the internet. The next great epoch of CBC.ca's prehistoric times grew out of the earth-shaking technology of the internet. It begins in 1993, the year key players at the corporation sat up and took notice of the burgeoning network. In Halifax, building websites became a pet project of Fred Mattocks (now CBC's executive director of English television production and resources.) Mattocks, who considers himself "the godfather of English .ca" had experimented on the internet before the predominance of the web, and had even built a personal website called Ask Fred (“today, it would be a blog”.) He also set the wheels in motion for building a site for the flagship youth program Street Cents. In Toronto, the corporation assembled a team dedicated to exploring new technologies. It included Diane Williamson, Paul Mills and Bob Kerr. "The internet was just emerging from being a scientific, academic tool," Kerr remembers. "We were given the time and latitude to research and read about new platforms." A seminal moment for Kerr was attending a lecture by MIT technology guru Nicholas Negroponte, who predicted the internet would revolutionize communications. Soon after, Williamson told the group about an Ottawa scientist named Andrew Patrick, who was writing a thesis about audio on the internet. Patrick, who worked for the Communications Research Council, was a CBC listener and fan. He approached CBC about putting some CBC Radio programming online. It seemed like a natural pairing. In December 1993, the CBC Radio on the Internet trial began. 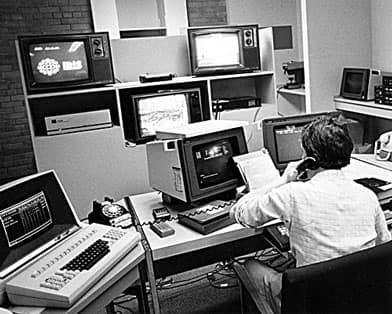 Patrick borrowed episodes of Quirks & Quarks, Basic Black, Sunday Morning, Fireside Al and Ideas of Canada, and encoded them into .au files at his Ottawa laboratory. They were then offered for download via FTP, Gopher and the World Wide Web on debra.dgbt.doc.ca, a well-known server used for distributing Canadian government documents. Patrick announced the experiment via press release and on Usenet groups, and waited to see what would happen. The response was overwhelming, literally: it easily maxed out the bandwidth available on the server's paltry 56 Kbps shared connection to the internet. A second phase of the trial began, with a 256 Kbps connection and automated daily encoding of CBC programs. Duplicate "mirror" sites were established to further ease the burden. CBC Radio was so impressed by the technology that it made internet-delivered audio a permanent offering the following year. 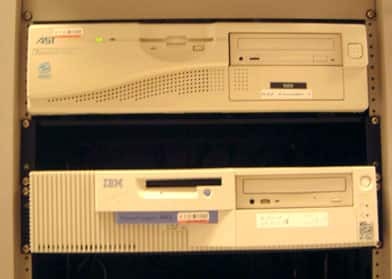 The corporation purchased a server and internet connection, launching radio.cbc.ca in December of 1994 – the corporation's first serious website. In June 1995, it purchased a license for 10 simultaneous streams of RealAudio, offering streaming audio for the first time. Which brings us to the final prehistoric era of CBC.ca, the dawning of HTML as the internet weapon of choice. One person who had carefully followed the corporation's internet experiment was CBC Radio technician Joe Lawlor. According to manager Bob Kerr, Lawlor regularly hounded the new platforms team for a job once funding came through. He eventually prevailed, and became the corporation's first webmaster – and in turn the first full-time employee of what would become CBC.ca. CBC Television followed suit, launching its own site in the fall of 1995. The website was operated by Gary Wagner of CBC IT. But to the distress of site staff, soon after the launch, Wagner fell ill and passed away. Running the site fell to Marlyn Persaud of CBC's communications department. In late 1995, preparations began for a breaking news site. It launched as Newsworld Online in July 1996 under Ken Wolff. One key question remained unanswered: who was in charge? "Communications had decided the internet was a communication tool. IT thought it was a distribution tool," manger Bob Kerr recalls. "And there was still no official endorsement from CBC management – it was a sideline." Individual programs were already getting into the act; in March 1996, The National launched a large site to complement the nightly news program. Official endorsement (along with a corporate head of new media, and the first dedicated budget) finally came under technophile CBC President Perrin Beatty. But this brought a new set of problems, including budget envy from cash-strapped radio and television programs. There were also concerns that corporate control would turn CBC.ca into a corporate tool, squashing the close relationships that had formed between journalists and their websites. "These guys were going to bigfoot everyone else," says Fred Mattocks. "I spent the next 10 years – literally – in a struggle… to get CBC.ca in the media family, where it belongs." The result was a decidedly mixed bag: There was an explosion of interesting and diverse web content and experimentation, but it appeared as a motley collection of seemingly unrelated sites, characterized by brand confusion and internal political divisions. "Radio had carved out its own piece, to use as its own playground. TV did that too, with no commitment or any thought of the audience, or the user experience," Fred Mattocks recollects. Far from being user-friendly, CBC.ca was organized according to the territorial battles of the day. "The user got a reflection of how we were structured internally," remembers Bob Kerr. And that takes us to the modern era, already a decade old. By the July 3, 1996 launch of Newsworld Online, the corporation knew it needed to be online, providing news, information and entertainment in the places Canadians were increasingly looking for it. Successful as such sites were, there was a long way to go. CBC.ca's next five years would be characterized by the dual mantras of "fixing the basics" and "putting the user first." Focus groups would be tested, usability experts consulted, design and branding firms engaged, sites rethought and redesigned. Eventually, the disparate parts would come together as one entity: CBC.ca, one of the top news and information websites in Canada. It certainly isn't perfect. If you dig deep enough in the site's half-million pages, you'll no doubt uncover some rather unsightly artifacts of bygone eras. Try to consider these fossils kindly: they are the bones of our online ancestors, the electronic DNA that tells us where we've come from. And, lest we get too self-congratulatory in our 10th year online, they remind us of the long evolutionary road ahead.